Anagram and Copy Treatment (ACT) is a type of treatment technique used to strengthen written communication skills in aphasia. ACT incorporates a structured task hierarchy to elicit the correct spelling of functional words. ACT has been shown to be beneficial for improving written naming skills. So…what’s the anagram box for? An early step in the approach calls for the patient to arrange anagram letters to correctly spell functional target words. Then the patient repeatedly copies the word in later steps, eventually writing the stimulus word with no visual model (that’s the ultimate goal!). Do I really need an anagram box? Well, truthfully you don’t have to make one. Anagram letters can be easily sketched out on paper or a notecard before or during the session, and then cut out. But I found that the more I used this technique, the more tedious it became to cut them out over and over. There is something to be said for having grab-and-go materials as a busy clinician. 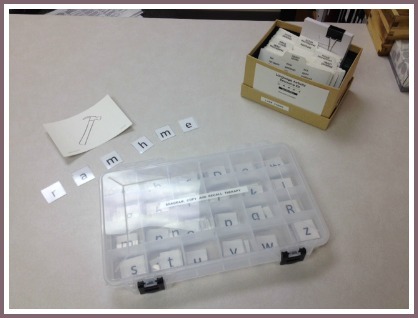 Target visual organization at the end of the session by encouraging the patient to sort the letters back into their corresponding sections. Chapey, Roberta. “Cognitive Neuropsychological Approaches to Treatment of Language Disorders.” Language Intervention Strategies in Aphasia and Related Neurogenic Communication Disorders, 4th ed., Wolters Kluwer, Lippincott Williams & Wilkins, 2001.